If you’re considering buying real estate in Sunset Beach, North Carolina, come experience life here on a trial basis. Come stay in one of our Sunset Beach affordable vacation rentals and enjoy the pleasures of Sunset Beach that is usually only experienced by those living here full time. While you’re here don’t miss the walk-through Mad Inlet to Bird Island, where endangered species thrive and you can leave a message in the “Kindred Spirits” mailbox. On the mainland are shopping centers, grocery stores, small boutiques, dining, golf and the Ingram Planetarium. For those who enjoy shopping or strolling along, nearby Shallotte has shopping malls, a movie theater and the North Carolina Welcome Center. South of Sunset Beach is Calabash, the “Seafood Capital of the World,” known for its seafood restaurants since the late 1940s. Deep-sea fishing boats are docked in town waiting to take you on adventure cruises. 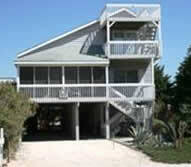 Golf is a favorite pastime in this area, with courses close by many of our Sunset Beach affordable vacation rentals. On February 28, 2012 the Odell Williamson Auditorium will present the 2011-2012 Performing Art Series. The Harry James Orchestra performs at 7:30 p.m. at the Odell Williamson Auditorium, Supply, N.C. Contact Box Office for ticket pricing. 910-755-7416 or 800-755-1050 Ext 7416. Whether you’re vacationing in one of our Sunset Beach affordable vacation rentals or you already live here, it’s not hard to see what brings people back time and time again to beautiful Sunset Beach.